Faster Stata for big data. This packages uses C plugins and hashes to provide a massive speed improvements to common Stata commands, including: collapse, reshape, xtile, tabstat, isid, egen, pctile, winsor, contract, levelsof, duplicates, and unique/distinct. This package provides a fast implementation of various Stata commands using hashes and C plugins. The syntax and purpose is largely analogous to their Stata counterparts; for example, you can replace collapse with gcollapse, reshape with greshape, and so on. See the remarks below for a comprehensive list of differences (including some extra features!) and each command's usage page for detailed examples. gcollapse collapse 9 to 300 / 4 to 120 (+) Quantiles, merge, labels, nunique, etc. gegen egen 9 to 26 / 4 to 9 (+,.) labels Weights, quantiles, nunique, etc. pctile 13 to 38 / 3 to 5 (-) Ibid. _pctile 25 to 40 / 3 to 5 Ibid. (+) The upper end of the speed improvements are for quantiles (e.g. median, iqr, p90) and few groups. Weights have not been benchmarked. (.) Only gegen group was benchmarked rigorously. (-) Benchmarks computed 10 quantiles. When computing a large number of quantiles (e.g. thousands) pctile and xtile are prohibitively slow due to the way they are written; in that case gquantiles is hundreds or thousands of times faster, but this is an edge case. (-) fastxtile from egenmisc and astile were benchmarked against gquantiles, xtile (fasterxtile) using by(). (+) Only egen group was benchmarked rigorously. strL variables only partially supported on Stata 14 and above; gcollapse, gcontract, and greshape do not support strL variabes. Due to limitations in the Stata Plugin Interface, gtools can only handle as many variables as the largest matsize in the user's Stata version. For MP this is more than 10,000 variables but in IC this is only 800. See this issue. Gtools uses compiled C code to achieve it's massive increases in speed. This has two side-effects users might notice: First, it is sometimes not possible to break the program's execution. While this is already true for at least some parts of most Stata commands, there are fewer opportunities to break Gtools commands relative to their Stata counterparts. Second, the Stata GUI might appear frozen when running Gtools commands. If the system then runs out of RAM (memory), it could look like Stata has crashed (it may show a "(Not Responding)" message on Windows or it may darken on *nix systems). However, the program has not crashed; it is merely trying to swap memory. To check this is the case, the user can monitor disk activity or monitor their system's pagefile or swap space directly. The OSX version of gtools was implemented with invaluable help from @fbelotti in issue 11. Gtools was largely inspired by Sergio Correia's (@sergiocorreia) excellent ftools package. Further, several improvements and bug fixes have come from to @sergiocorreia's helpful comments. gunique, based on unique by Michael Hills and Tony Brady. gdistinct, based on distinct by Gary Longton and Nicholas J. Cox. disp "`:var label mean', `:var label p50'"
See the FAQs or the respective documentation for a list of supported gcollapse and gegen functions. gcollapse supports every collapse function, including their weighted versions. In addition, weights can be selectively applied via rawstat(), and several additional statistics are allowed, including nunique, select#, and so on. gegen technically does not support all of egen, but whenever a function that is not supported is requested, gegen hashes the data and calls egen grouping by the hash, which is often faster (gegen only supports weights for internal functions, since egen does not normally allow weights). Hence both should be able to replicate all of the functionality of their Stata counterparts. 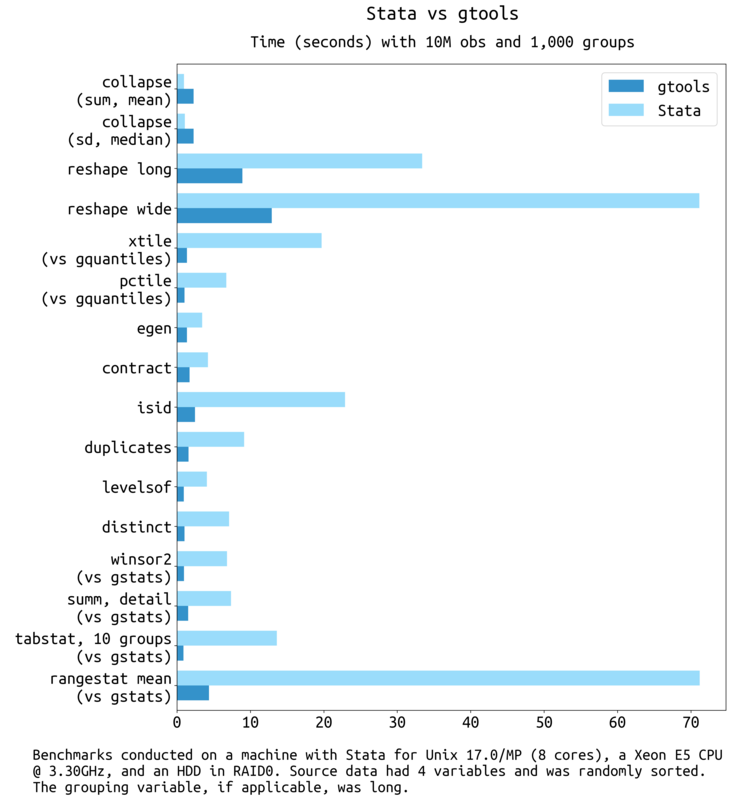 Last, gstats tab allows every statistic allowed by tabstat as well as any statistic allowed by gcollapse; the syntax for the statistics specified via statistics() is the same as in tabstat. (+) first, last, firstmn, and lastnm are different from their counterparts in the egenmore package and, instead, they are analogous to the gcollapse counterparts. but preserving the original sort order. In case an egen option might conflict with a gtools option, the user can pass gtools_capture(fcn_options) to gegen. rawstat allows selectively applying weights. gcollapse (nansum) and gcollapse (rawnansum) outputs a missing value for sums if all inputs are missing (instead of 0). gcollapse, merge merges the collapsed data set back into memory. This is much faster than collapsing a dataset, saving, and merging after. However, Stata's merge ..., update functionality is not implemented, only replace. (If the targets exist the function will throw an error without replace). gcollapse, labelformat allows specifying the output label using placeholders. gcollapse, sumcheck keeps integer types with sum if the sum will not overflow. Several option allow turning off error checks for faster execution, including: fast (similar to fast in gcollapse), unsorted (do not sort the output), nodupcheck (allow duplicates in i), nomisscheck (allow missing values and/or leading blanks in j), or nochecks (all of the above). Subcommands gather and spread implement the equivalent commands from R's tidyr package. At the moment, j(name [values]) is not supported. All values of j are used. "reshape mode" is not supported. Reshape variables are not saved as part of the current dataset's characteristics, meaning the user cannot type reshape wide and reshape long without further arguments to reverse the reshape. This syntax is very cumbersome and difficult to support; greshape re-wrote much of the code base and had to dispense with this functionality. For that same reason, "advanced" syntax is not supported, including the subcommands: clear, error, query, i, j, xij, and xi. Category frequencies can also be requested via binfreq[()]. Quantiles can be requested via percentiles() (or quantiles()), cutquantiles(), or quantmatrix() for xtile as well as pctile. Cutoffs can be requested via cutquantiles(), cutoffs(), or cutmatrix() for xtile as well as pctile. The user has control over the behavior of cutpoints() and cutquantiles(). They obey if in with option cutifin, they can be group-specific with option cutby, and they can be de-duplicated via dedup. Fixes numerical precision issues with pctile, altdef (e.g. see this Statalist thread, which is a very minor thing so Stata and fellow users maintain it's not an issue, but I think it is because Stata/MP gives what I think is the correct answer whereas IC and SE do not). Fixes a possible issue with the weights implementation in _pctile; see this thread. weights are supported for internally implemented functions. gegen upgrades the type of the target variable if it is not specified by the user. This means that if the sources are double then the output will be double. All sums are double. group creates a long or a double. And so on. egen will default to the system type, which could cause a loss of precision on some functions. For internally supported functions, you can specify a varlist as the source, not just a single variable. Observations will be pooled by row in that case. While gegen is much faster for tag, group, and summary stats, most egen function are not implemented internally, meaning for arbitrary gegen calls this is a wrapper for hashsort and egen. Saving the output is done via mata instead of r(). No matrices are saved in r() and option save is not allowed. However, option matasave saves the output and by() info in GstatsOutput (the object can be named via matasave(name)). See mata GstatsOutput.desc() after gstats tab, matasave for details. GstatsOutput provides helpers for extracting rows, columns, and levels. Options casewise, longstub are not supported. Option nototal is on by default; total is planned for a future release. Option pooled pools the source variables into one. Option matasave saves output and by() info in GstatsOutput, a mata class object (the object can be named via matasave(name)). See mata GstatsOutput.desc() after gstats sum, matasave for details. Option noprint saves the results but omits printing output. Option pooled pools the source variables and computes summary stats as if it was a single variable. Largest and smallest observations are weighted. display options are not supported. Factor and time series variables are not allowed. It can take a varlist and not just a varname; in that case it prints all unique combinations of the varlist. The user can specify column and row separators. It can deduplicate an arbitrary number of levels and store the results in a new variable list or replace the old variable list via gen(prefix) and gen(replace), respectively. If the user runs up against the maximum macro variable length, add option nolocal. No support for using. The C plugin API does not allow to load a Stata dataset from disk. Option sort is not available. It can also check IDs with if and in conditions. hashsort behaves as if mfirst was passed. To recover the default behavior of gsort pass option mlast. gduplicates does not sort examples or list by default. This massively enhances performance but it might be harder to read. Pass option sort (sorted) to mimic duplicates behavior and sort the list. Hashing the data and sorting a hash is a lot faster than sorting the data to then process it by group. Sorting a hash can be achieved in linear O(N) time, whereas the best general-purpose sorts take O(N log(N)) time. Sorting the groups would then be achievable in O(J log(J)) time (with J groups). Hence the speed improvements are largest when N / J is largest. Compiled C code is much faster than Stata commands. While it is true that many of Stata's underpinnings are compiled code, several operations are written in ado files without much thought given to optimization. If you're working with tens of thousands of observations you might barely notice (and the difference between 5 seconds and 0.5 seconds might not be particularly important). However, with tens of millions or hundreds of millions of rows, the difference between half a day and an hour can matter quite a lot. The overhead involves copying the by variables, hashing, sorting the hash, sorting the groups, copying a sort index back to Stata, and having Stata do the final swaps. The plugin runs fast, but the copy overhead plus the Stata swaps often make the function be slower than Stata's native sort. The reason that the other functions are faster is because they don't deal with all that overhead. By contrast, Stata's gsort is not efficient. To sort data, you need to make pair-wise comparisons. For real numbers, this is just a > b. However, a generic comparison function can be written as compare(a, b) > 0. This is true if a is greater than b and false otherwise. To invert the sort order, one need only use compare(b, a) > 0, which is what gtools does internally. However, Stata creates a variable that is the inverse of the sort variable. This is equivalent, but the overhead makes it slower than hashsort. Update benchmarks for all commands. Still on 0.8 benchmarks. geomean for geometric mean (exp(mean(log(x))) for gcollapse, gstats tab, gegen). Implement collapse() option for greshape. Add support for binary strL variables. Add memory(greedy|lean) to give user fine-grained control over internals. Create a Stata C hashing API with thin wrappers around core functions. This will be a C library that other users can import. Improve code comments when you write the API! Hi! I'm Mauricio Caceres; I made gtools after some of my Stata jobs were taking literally days to run because of repeat calls to egen, collapse, and similar on data with over 100M rows. Feedback and comments are welcome! I hope you find this package as useful as I do. ftools: The main inspiration for gtools. Not as fast, but it has a rich feature set; its mata API in particular is excellent. reghdfe: The fastest way to run a regression with multiple fixed effects (as far as I know). ivreghdfe: A combination of ivreg2 and reghdfe. stata_kernel: A Stata kernel for Jupyter; extremely useful for interacting with Stata. stata-cowsay: Productivity-boosting cowsay functionality in Stata. Gtools is MIT-licensed. ./lib/spookyhash and ./src/plugin/common/quicksort.c belong to their respective authors and are BSD-licensed. Also see gtools, licenses.